Back in August, I participated in All Virago/All August, not taking it literally, which means that I didn’t dedicate the whole month to reading only Viragos. I made a small list and read a few books but there were still some more left. 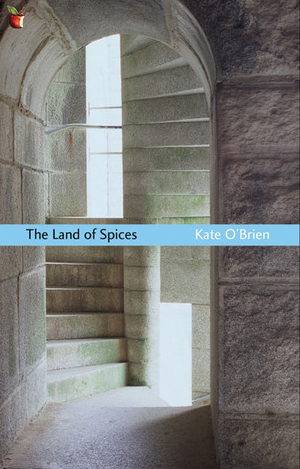 One of those was Kate O’Brien’s The Land of Spices. The Land of Spices tells the story of Sister Marie-Hélène, the Reverend Mother of a French order located in Ireland, and a young Irish girl, Anna Murphy. When the book opens, little Anna, who is only six years old, has just joined the convent, which is also a boarding school for rich girls. She is the youngest child who has ever been accepted and Mère Marie-Hélène whom everyone calls “cold” is surprised that she reacts so strongly to this little girl. Not only does she feel she has to protect the girl, but she also feels some a kinship. This kinship triggers memories of her own childhood when she too joined the convent as a boarder. Back then, she lived in Brussels with her parents, although they were English. Since her childhood she always felt much closer to her father and when her mother died, when she was only twelve, they grew even closer. But something happened. Something that made Marie-Hélène not only become a nun but flee her father. While this isn’t something she has repressed, she has repressed the memory of a wonderful childhood and the relationship with her father which once meant the world to her. All through the book, there are allusions to what happened and I was a bit afraid, we wouldn’t find out what it was. I actually feared that it was something quite different and once the truth is revealed I was relieved. However, at the time when this is set, before WWI, Marie-Hélène’s discovery would have come as a shock. Let’s leave it at that or I’ll spoil the book. The presence of Anna and the strong feelings she triggers, make Mère Marie-Hélène remember. The book follows the lives of these two women until the day, when Anna graduates and Mère Marie-Hélène is finally granted her wish to go back to Brussels. The descriptions of life at the convent were fascinating and because Kate O’Brien is so good at capturing people’s follies and foibles, this is also a very funny book. There’s a chapter dedicated to a concert that made me laugh so much. I can honestly not remember having read anything this funny in a long time. It reminded me of similar moments in my childhood, when people who were a little too full of themselves made total fools out of themselves and you had to pretend what they were doing was great and try not to laugh. The whole chapter dedicated to this concert is a tour de force of witty characterisation. While it had funny aspects, it’s not a humorous novel per se. It’s the story of a very unusual life. A life that could have gone a very different way, especially since Marie-Hélène initially didn’t join the convent for religious reasons. Nonetheless, she makes the most of her career choice, strives for goodness and fights hard for her faith. The foreword points out that this is also a rare study of a world in which the hierarchy is almost purely female. Yes, there are priests and bishops visiting, but those in charge in the convent are women. And the successor of the Mere Générale, the head of the order, will be named by a woman. Since the main protagonist is English and the book is set just before WWI, Home Rule and the Irish’s fight for independence are very important topics. The Reverend mother often thinks she’s an outsider because she is English, but the novel shows us that she might just be one of those people who will always be outsiders. She’s too easily wounded and that’s why she’s built a wall around herself nobody can break through. When the book was published in 1941, it caused a bit of stir as there was a scene that was considered risqué. It’s not risqué at all because all it says is that the narrator saw someone in an embrace. Nonetheless, Kate O’Brien had a hard time getting other books published and this one was condemned by the Censorship Board. Possibly however, as the foreword says, this was far less because of the sexual allusion but because she poked fun at convent hierarchy and criticized the sisters, depicting them in a very realistic, not exactly saintly way. As I said before, I loved this book. I found the atmosphere soothing, the characters so well described and it had one of the funniest scenes I read in a while. this sounds like a hidden gem…. I’d say it is, yes. I’d never heard of this, Caroline – but then again, there are so many hidden treasures in the Virago list it’s hard to keep up with them all. It sounds like a very humane story. Also, your commentary on life in the convent reminds me of a film I saw recently, Anne Fontaine’s The Innocents, set within a Polish convent at the end of the second world. Have you seen it by any chance? I think one could spend years reading through their catalogue and find amazing books. I haven’t heard of the movie you mention but I’ll see if I can find it. I’m sure I would like it. This sounds very good. Convent life sounds so very removed fro our Twenty – First Century World. A seemingly realistic look inside of it sounds like it can make for a realistic book. The characters also sound very well crafted. It certainly does that’s why I found it so soothing. One could tell she went to a convent school that’s why it was so realistic. What serendipity as my library just had a ‘Friend of the Library book sale’ and I found two Viragos which I snapped up and this was one of them. So glad you liked it so much. I read one of her other books years ago, Mary Lavelle, which is set in Spain and I liked it, too. I also read (now that I look her up) The Last Summer, which has slipped from mind but now that I see the cover I remember I liked it a lot, too. Now I must get back to her soon since she seems reliably good! (Hope all is well with you–lovely to read your comments on my own blog today!). That is serendipitous indeed. The funny thing is, I thought I came across this book on your blog but couldn’t find any reviews. It was the right thing for me to read during this time. It had a bit of everything. I wouldn’t mind reading another one of her novels. Maybe it was The Last Summer you were thinking of as I read it not so long ago and you may have read the post so her name was in mind. She’s very good, isn’t she? Last night I picked up The Land of Spices–now I want to read a Virago in general and maybe this one in particular! No, I don’t think so. Maybe I saw it mentioned somewhere else. I think I’d like to read at least one Virago per month. I went through my piles and disocvered I own quite a few. Not the green ons though, so maybe that’s why I didn’t notice how many I have. Have you read Antonia White’s Frost in May? No I haven’t but it has always tempted me. Is it similar? I remember reading reviews of it. Possibly on Danielle’s blog and making a mental note to get it. Thanks for reminding me. Beautiful review, Caroline! I love the title! Sorry to know that the book wasn’t well received when it came out because it looks fascinating. It reminds me of Rumer Godden’s Black Narcissus. Thank you, Vishy. I own one of Rumer Godden’s books and was actually wondering if they are similar. I liked this a geeat deal. I can see why it was problematic at the time. Especially in Ireland. I can’t say why though because that would ruin the discovery of the Reverend Mother’s secret. WAsn’t Balck Narcissus made into a movie? The title sounds so familiar. I will look for Kate O’Brien’s book. Thanks for not revealing the surprise 🙂 Yes, Black Narcissus was made into a movie with Deborah Kerr in the lead role. It is very beautiful. I loved the movie. Hope you get to watch it. Ah exactly . . . I knew there were famous actors in it. I’ll try to watch it. I hope you’ll like Kate O’Brien. I agree, this aspect annoyed the censors but there’s something more which I can’t tell. Honestly, given the choice between mother of many and married to someone you might not like, governess and spinster, nun doesn’t seem so bad.There was also a camaraderie and taking care if the elderly which sounds appealing and it’s certainly a career when you can climb the ladder. I think I got a book she mewhere which I’ve been meaning to read for ages about nuns. I need to find it. I hope you will. I think it offers a lot. I’ve been meaning to read Richard Yates and Elizabeth Taylor for ages since seeing so many wonderful posts about their work from bloggers I love, such as yourself and Jacqui. However, I was immediately arrested by the cover of Banana Yoshimoto’s book in the top corner of your blog; it looks wonderful too! 2017 has to be a better year of blogging for me; I feel too removed from the goings on in my beloved book world online. Happy New Year! I can’t wait to hear what you think of Richard Yates and Elizabeth Taylor. I’m pretty sure you will like them. The English translation of Moshi Moshi only just came out. Yoshimoto’s book is my third Japanese book in two weeks. I loved all of them. I haven’t finished Moshi Moshi but I will soon. Now I only need to review them. I too hope it will be a better blogging year.